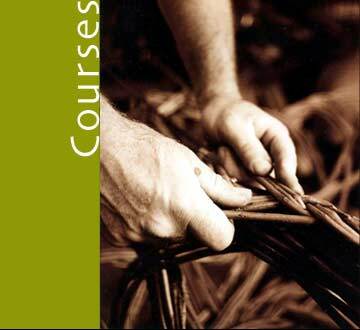 Malcolm teaches weekend basket making courses throughout the year at his workshop at Browns Farm yard. The workshop lies in the heart of West Dorset a mile from the ancient iron age hill fort at Eggardon and has far reaching views across the beautiful Dorset countryside. Malcolm is an experienced teacher and provides a high standard of tuition. Numbers on the courses are limited to a maximum of six to allow for more individual attention. Students are taught traditional weaving techniques used by professional basket makers. The Introduction to Basket Making course is for beginners and improvers. Surrounded by baskets, willow and the tools of the trade, participants will gain an insight into the tradition of willow basket making and will complete at least one basket to take home. Other courses can be custom built around your needs. Intermediate basket making , coracle building, garden structures etc; can be arranged according to demand. With such a beautiful setting in easy reach of the Jurassic coast, good walks, pubs and good company, courses at Browns Farm yard fill quickly. Two day basket making course. Immerse yourself over two days to produce a beautiful basket to take home and enough time to really understand the processes involved. Cost £195 including all materials and a delicious home made lunch. We are also running a one day course on how to make a willow wigwam for your garden. Cost £120 including all materials and a delicious home made lunch. "A weekend course with Malcolm leaves you with aches and pains in muscles you never knew existed but it is better than any spa treatment in the world. The baskets I have made are like pets that come with me everywhere in the garden, from the first wildly wonky ones to some I can barely believe are my own work. Make sure you leave a handle unfinished, the perfect excuse to keep going back. "Tania Compton gardening editor House & Garden.